"It used to be funny when Hawk would talk about selling everything we own and buying a food truck, but I think he might be serious this time. The other day I caught him looking at listings for mobile smokers on eBay and he keeps dropping hints about an industrial deeper fryer he wants for Christmas!" Brandy's friend Bailey was explaining about her husband. "Well, life on the road has its advantages. But why has he come down with wanderlust all of the sudden?" "He's been watching a ton of barbecue shows and he thinks he needs to go South to brush up his skills." "Well, that's nonsense. 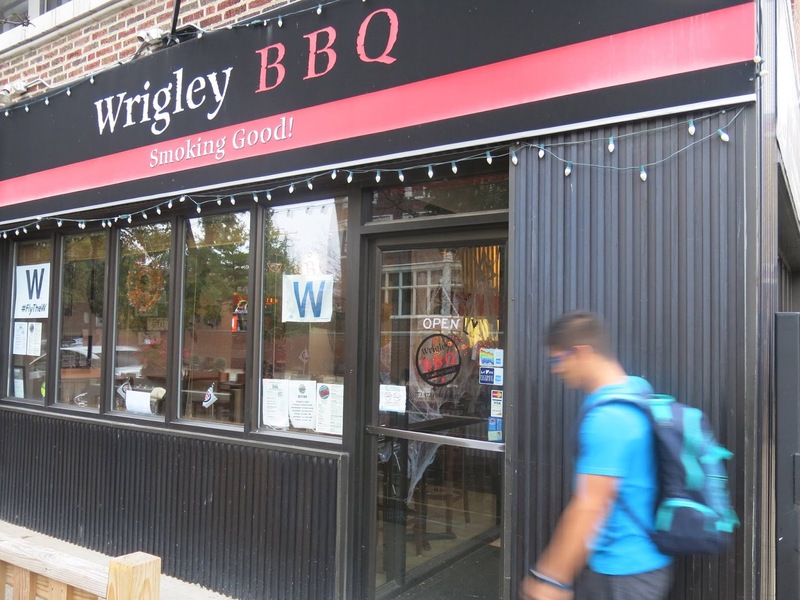 There's wonderful barbecue right here in Chicago!" "But it's better in the South, isn't it?" "Tell you what. Get your coat and we'll go get some barbecue for brunch. Then you can tell me if you need to cross the Mason Dixon line to eat real meat." 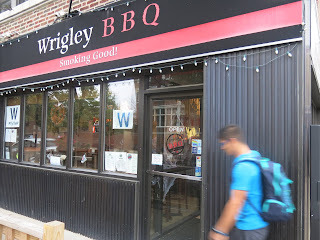 Brandy took her friend along to check out the recently revamped Wrigley BBQ in the heart of East Lakeview. Since being taken over by Mitch Liebovich (who previous ran a successful barbecue restaurant in Pittsburgh), the entire menu has been renewed to focus on smoked meats (as opposed the previous menu, which put more focus on the sauces) and barbecue classics tweaked for the Midwestern palate. Mitch himself actually met with Brandy and Bailey, letting his passion for great food shine as he explained the changes he'd implemented so far and what he hoped to do in the future, including additions to some of the pre-existing restaurant design. Getting themselves a glass of Cheerwine from the soda fountain (Brandy was over joyed to see the North Carolina favorite soft drink), they started in with an appetizer of fresh made Jalapeno Cornbread. Ever spice shy, Brandy was a little concerned, but the peppers just ended up lending more of smokey flavor than any heat. 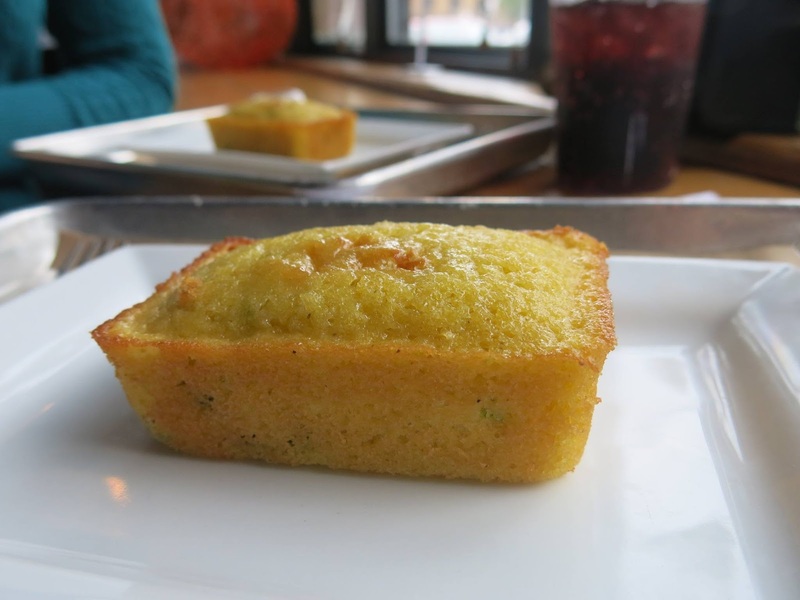 The bread texture was utterly perfect, being moist and bouncy without crumbling to pieces, and it had just the right amount of sweetness and grit to it. Next up, the ladies decided to dive into an order of Chicken Nachos. The gigantic portion was more than a little intimidating, especially considering they still had more food coming in the pipeline, but they were both so happy after taking their first bite that they had decided to indulge. 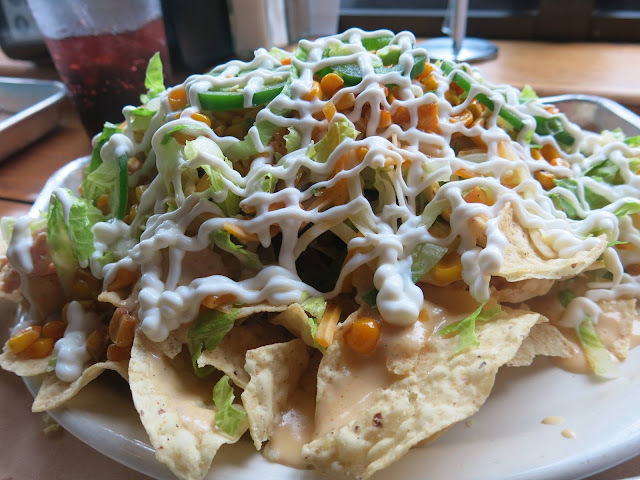 The nachos were deeply satisfying on every level, having been loaded with sour cream, shredded cheese, sweet corn, BBQ beans, succulent pulled chicken meat, and cool shredded lettuce. "There is no being delicate with a plate of food like this," Brandy commented, BBQ sauce penetrating the crevices between her fingernails and sour cream clinging to her lips. The biggest surprise was just how juicy and flavorful the chicken meat was. "I thought getting chicken would be a cop out, but this is amazing!" said Bailey. Unable to decide between the Brisket Hash and the Biscuits and Gravy, Bailey compromised by ordering the hash with a side of gravy and a single biscuit. "I would have been happy with just the hash but once Mitch explained how he makes the gravy to order and actually puts his barbecued brisket into it, I knew I had to try some." Bailey, the ultimate gravy connoisseur, was not disappointed in the least; the gravy was hearty enough to be a meal in itself, and when combined with the surprisingly light and buttery biscuit, it was pure heaven. 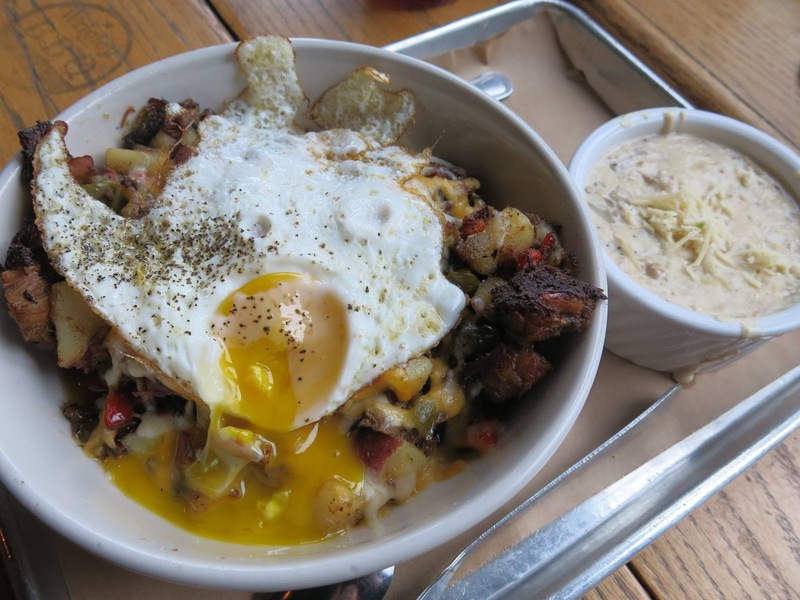 The hash wasn't anything to be sneezed at either, with a creamy cap of cheese covering a very generous helping of melt-in-the-mouth brisket, crispy potatoes, and topped by a perfectly fried egg. Brandy picked the BELT, a take on a BLT with smoked and crisped pork belly in place of the bacon as well as sharp cheddar and avocado joining the party. The pork belly had a really unique texture from first having been smoked and then slightly crisped up, which Brandy rather enjoyed as a textural contrast next to the soft veggies and the Texas Toast. "It speaks to how well balanced this is that even with a rather large slab of meat in here, this sandwich isn't overly rich or greasy. 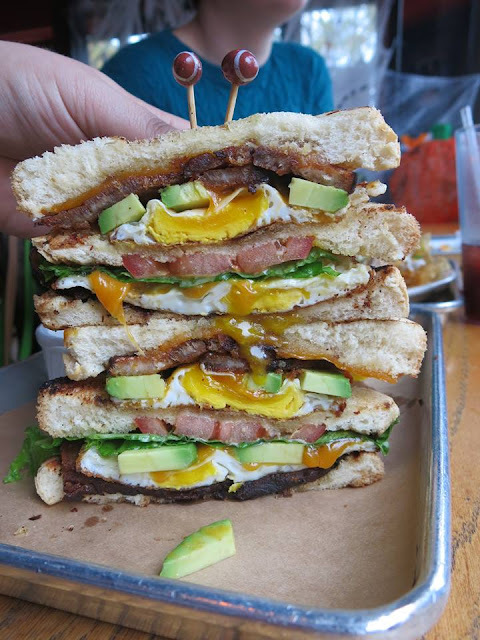 That's a rare thing to find in a breakfast sandwich," she pointed out. Finally, they decided to round out their meal with something sweet; the Bourbon Bread Pudding French Toast, which had a seasonal variation prepared with pumpkin bread. 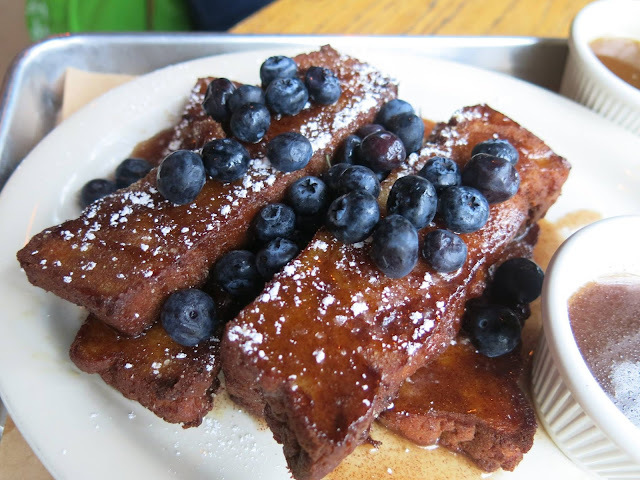 Instead of being presented in slices, this french toast came in thick cut sticks ("That's what we Brits call 'Soldiers.' Perfect for dipping into egg yolks," as Brandy explained to her friend). The result of having cut the toast in such a fashion was a very crispy exterior and a pure custard interior, and with this version having been made with real pumpkin puree, it gave the impression of being the filling of creamy pumpkin pie. Pouring the homemade bourbon syrup over that French toast was the single most satisfying experience Brandy had that day, possibly even that week. "I've never had a French toast like this!" Bailey exclaimed, "I'd say I want to bring some of this home so Hawk can try it, but I don't know if I'm going to be able to share." Thoroughly stuffed, Brandy and Bailey finally began to pack up their things. Mitch's hospitality was certainly something that stuck with both of them, and the passion he so clearly put into his food impressed Bailey to such an extent that she was already planning to bring Hawk for a return visit before they had even left the restaurant. 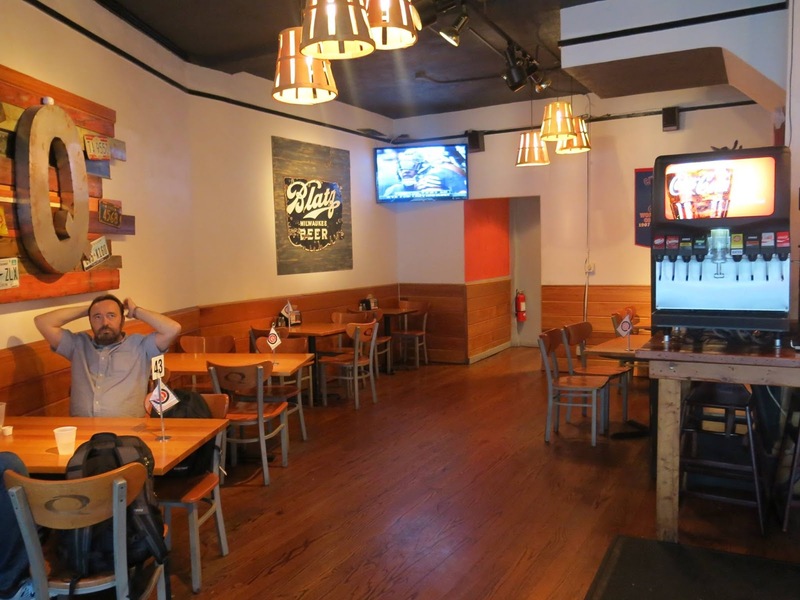 "I guess there really is good barbecue to be found in Chicago, if you know where to look," said Bailey. "I know where to look; under my finger nails. Next time, I'm bringing gloves," said Brandy.